The perfect blend of sweet and savory flavors, this Oasis thousand island dressing will deliver just the right amount of tangy taste to your customers' food. This classic Thousand Island dressing is perfect for drizzling over salads, while adding thick texture and well-seasoned taste. Since salads make such a popular menu item, it's important to satisfy your patrons with great-tasting dressings! Let this dressing soak into fresh breads to give any sub a satisfyingly tangy flavor. It adds a pop of zesty flavor to just about any sandwich, and it can often be used in place of Russian dressing for classic Reuben sandwiches. 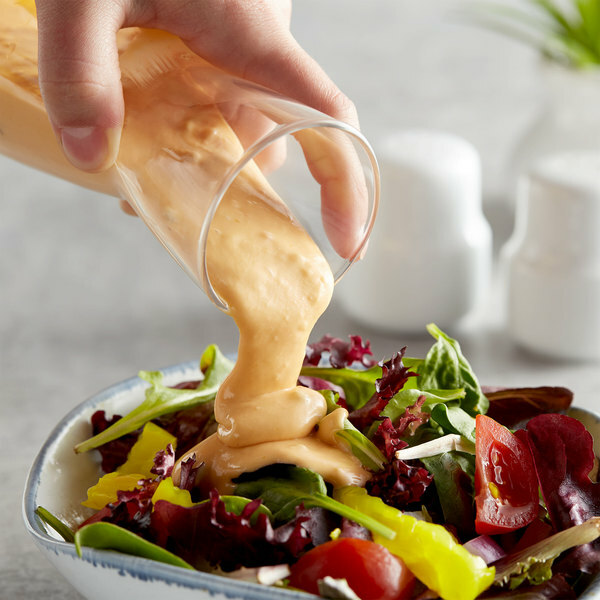 Offer Thousand Island dressing as a condiment at your salad bar, deli, or take out station, so that your customers can apply just the right amount to their dishes! Thousand Island dressing has been a popular condiment since the 1950s. Fusing the bold flavors of fresh-from-the-vine tomato, relish, and oil lightly sweetened and peppered with bold spices, this creamy Thousand Island dressing will delight your customers with the traditional taste they know and love. Featuring an eye-catching reddish-orange color, this dressing can be added to a variety of dishes as a quick and easy way to enhance profitable menu items! 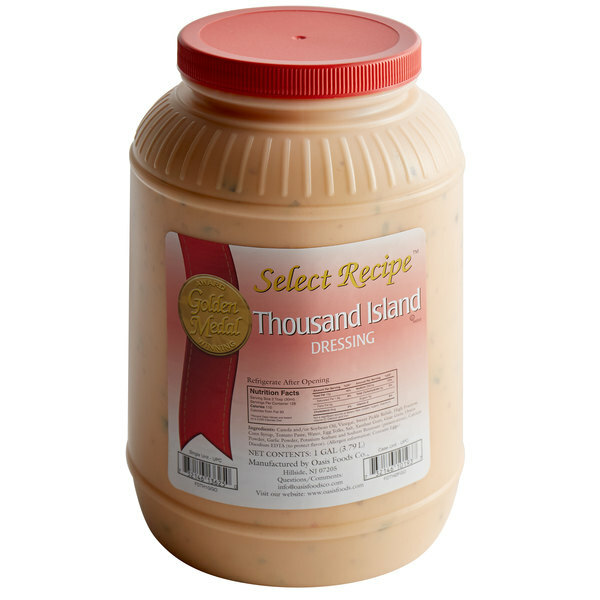 thousand island dressing is used for many things on our menu such as, salads, sandwiches, dressings, dipping sauces. its the perfect amount for how much it is used within the cafe. This is a great tasting alternative to the well known salad dressing companies and it is low priced. This is great for buffets, commercial kitchens and for school cafeterias. A very nice thousand island dressing that is tangy and creamy. It is perfect for salads or putting on sandwiches. It really adds a nice flavor to your meals. So easy to use on sandwhiches, and is much easier than making it by yourself from scratch. Good flavor combination and it comes at a great price. This is easier than always making your own salad dressing. It is great to have on hand. The price is certainly right for the amount. We make all our own salad dressing but dont offer Thousand Island. This premade great tasting dressing is great to have when we get a special request.